Last week we finally signed a seven year contract with Government for the new Specialty Wood Products (SWP) partnership which will focus on Douglas-fir, Cypress species and a range of eucalypt species. The new programme brings funding for non radiata species back to a sustainable level again with Government via MBIE contributing $710,000, matched dollar for dollar by industry investors and with Scion aligning $550,000 of its core funding with the objectives of the new programme. The Forest Grower Levy Trust is investing $300,000 per year with the remaining $410,000 being contributed by a range of industry investors. The programme aims to raise the confidence of investors to grow and process timber from these species into higher value products. 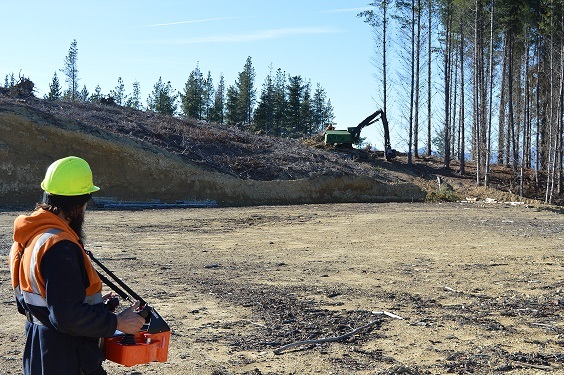 New Zealand is rapidly gaining international recognition for the innovation that is occurring in steep land harvesting and in particular the mechanisation of tree falling on steep land. Another development that is leading the world is the Future Forests Research remote controlled tracked harvesting machine. Fitted to a John Deere 909 self-levelling excavator the system is now undergoing operational trials with a contractor in the Nelson region. The tele operation system allows the full machine functions including tree felling to be controlled by an operator several hundred metres away from the machine. The completion of this development and successful trialling paves the way for the next phase of this project which is to house the operator in a console with the same controls as the machine cab. Video feeds will provide the operator with the same visibility as he/she would have from the cab of the machine yet in a safer and more comfortable working environment. This is an exciting development for the harvesting industry.